“The effectiveness of public schools in developing engaged citizens has rarely been examined empirically,” notes a new Mathematica report on the impact on civic participation of Democracy Prep, a network of charter schools that educates more than 5,000 students, mostly in New York City. Perhaps not, but it’s certainly been assumed. We remain sentimentally attached to a gauzy myth of the American common school ideal and its presumed role in citizen-making, even without evidence of its effectiveness. Bravo, Democracy Prep. But as a former (and hopefully future) DP civics teacher, I will confess that this finding is not particularly surprising to me. Honestly, I would have been alarmed if it were not the case. As the Mathematica paper notes, Democracy Prep students participate in annual voter registration campaigns and other forms of direct civic engagement. 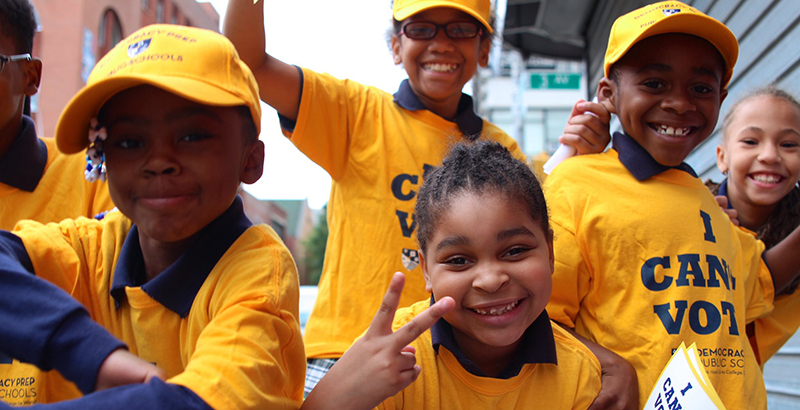 Nearly every fall, students as young as kindergartners can be seen on the streets of Harlem registering voters; they are unmistakable in their distinctive bright yellow T-shirts with the slogan “I can’t vote, but you can!” High school seniors work all year on capstone “Change the World” projects wherein they research a social problem of interest to them and then plan and execute some manner of public response — a fundraising drive, a protest, an awareness campaign, etc. Students routinely offer testimony to representatives at all levels of government. Food drives, volunteerism, and “service learning” are encouraged. Passing the U.S. Citizenship Test is a graduation requirement. The class that I taught was a seminar in civics and citizenship for graduating seniors, in which we would wrestle with constitutional issues at work in students’ lives, from campus speech codes to “broken windows” policing. All told, it is impossible to spend your school-age years at Democracy Prep and not get the message that active and engaged citizenship is what’s expected of you, with voting a rock-bottom, core adult responsibility. Candidly, I’m uncertain that we did a better job than other high-performing schools at actually teaching civics. But without question, Democracy Prep does a better job valorizing it. It’s in the school’s name, for Pete’s sake: preparation for democracy. If traditional public schools and districts want to reclaim the mantle of minting engaged and competent citizens, they have some valorizing work to do of their own. A few years ago, I did a small, informal research project examining the mission and vision statements adopted by the nation’s hundred largest school districts to see whether they still view the preparation of students for participation in democratic life as an essential focus of their work. The results were dispiriting. Civics and citizenship were not mentioned at all in in the mission statements of well over half of the districts surveyed. Their language suggested that school officials were much more focused on the private and personal outcomes of schooling — preparation for college and career, for example — than on minting public-minded adults who were prepared and motivated to vote, volunteer, donate, or any of the other activities common to active and engaged citizens. Those of us who worry about the civic mission of schools spend a lot of time worrying about how to promote student civic engagement. Yet the more time I spend thinking about this, the more I wonder if we’re not getting this exactly backward. As the Mathematica report demonstrates, schools can be where students go to become civically engaged adults. But schools are invariably where students go to experience the civic engagement of others. No child thinks of it this way, but surely, he or she picks up clear signals about their place in the world, how they are regarded by authority figures who are not their parents, and how much — or how little — is expected of them. If the relationship a child has with a school is coercive, punctuated by frustration and failure, leading to no good end, then there is no reason to expect strong civic outcomes. Civic engagement tends to rise with educational attainment, which is another non-surprise: If our relationship with school is productive, successful, and contributes to a good life outcome, we are more likely to feel invested in civil society. This transcends mere voting. It is enfranchisement in the best and broadest sense. Supreme Court Justice Potter Stewart famously observed that he could not define obscenity, “but I know it when I see it.” The same, I think, is true of the kind of school culture and climate that signals to children — particularly those historically least likely to have a positive experience of schooling — that their community and country are invested in them. The challenge for researchers is to identify this ineffable aspect of school culture and climate: Name it, quantify it, measure it, and help practitioners get better at replicating it, particularly as we fumble forward in trying to decide what outcomes schools ought to be held accountable for and how. This is an encouraging finding, and bracing. My Democracy Prep friends and colleagues should walk a little taller. But the bigger prize lies ahead. The degree to which young people will choose to become and remain civically engaged — not just voting, but volunteering, fundraising, demonstrating agency and advocacy — is the degree to which they feel fully and truly enfranchised. There can be no more important mission for public education than attaching children to civil society, investing them in its functioning, and encouraging them to play a role in building a more perfect union. 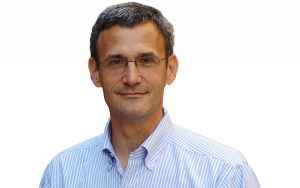 Robert Pondiscio is a senior fellow at the Thomas B. Fordham Institute. He is also a senior adviser to Democracy Prep Public Schools in Harlem, New York. Robert Pondiscio is a senior fellow at the Thomas B. Fordham Institute. He writes and speaks extensively on education and education-reform issues, with an emphasis on literacy, curriculum, teaching, and urban education.